Boy, when the rains hit here in Western Washington, they make you forget that we went a few months this Summer without any rain! But I’m not complaining. The rain brought back the green, which we have a lot of. Combined with the beautiful Fall colors, it makes me smile when I look out my window through the raindrops! So I’m bringing you another soup today. This one is a pretty severe adaptation of another one of Nana’s recipes. It’s called Instant Pot Mulligatawny Soup. Of course Nana’s was just called Mulligatawny Soup! 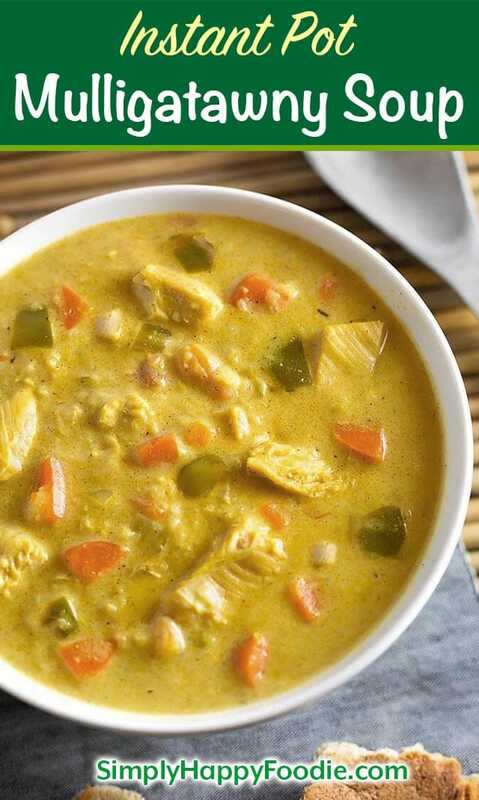 Mulligatawny Soup is an English version of an Indian soup. Literally translated it means Pepper Soup. From what I read it used to be much spicier, and didn’t originally have any meat in it. You could easily make this a vegetarian soup by simply omitting the chicken broth (use veggie broth) and meat. You could also get creative and add cut up sweet potatoes! Yum! I added a bit more spice to my version, and some other goodies to make this soup my own! Paul thought my version was really good! Shhh, don’t tell Nana (Though I do wonder how Nana would have liked the Instant Pot)! 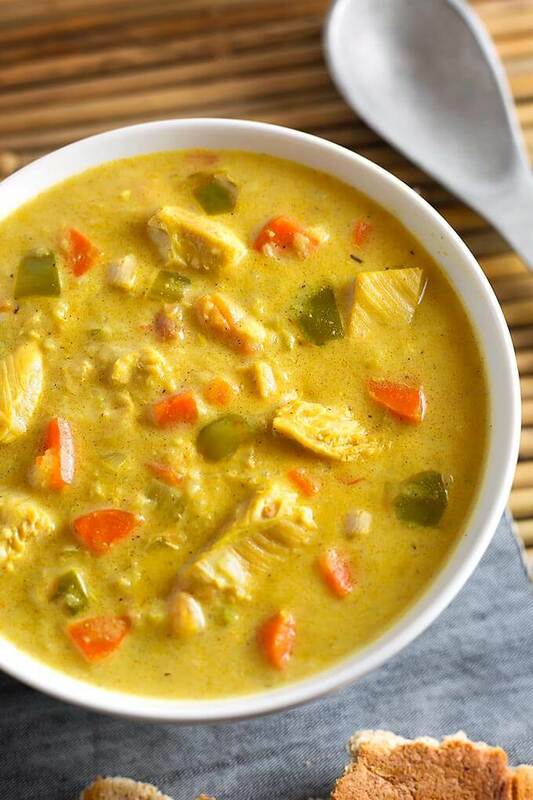 Instant Pot Mulligatawny Soup is a rich, warm, soup with a nice light Indian spice flavor. 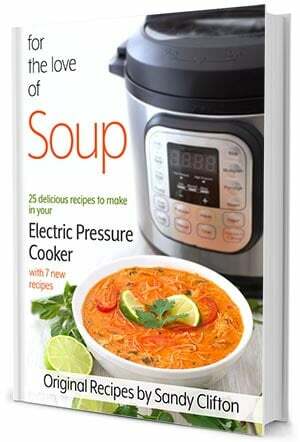 Make Mulligatawny in your electric pressure cooker! Pro Tip: First, prepare all of the produce and gather everything you will need to make this soup. It makes the process go smoothly, and you will have everything you need at your fingertips! I do this whenever I make a soup or dish with several ingredients. Turn on the pot to the Sauté mode (Normal heat). When the display reads "Hot" add the oil. Add the chicken and cook, stirring occasionally, until the cubes turn white, but are not fully cooked. Remove from the pot to a plate and set aside. Add the butter, onions, celery, carrots, and green pepper. Cook, stirring occasionally, for a few minutes, until the vegetables start to soften. Stir in the garlic and ginger, cook for 1 minute, stirring constantly. Sprinkle in the curry powder, garam masala, nutmeg, cinnamon, salt, pepper, and thyme. Stir. Add the chicken broth, stirring well to incorporate the flour into the broth. Add the reserved chicken, tomatoes, rice, apple, and cloves. Stir. Put the lid on the pot and lock in place. Set the steam release knob to the Sealing position. Cancel the Sauté mode. Press the Manual (or Pressure Cook) button and then the + or - to select 7 minutes. When the cooking cycle ends, just let the pot sit and naturally release the pressure for 20 minutes or more. Then turn the steam release knob to release the remaining pressure. When the pin in the lid drops, open the pot and stir the soup. Mix together the flour and the heavy cream (or coconut milk) and stir into the simmering soup. Let simmer until soup starts to thicken, then turn off the pot. Serve hot with some Naan or crusty bread. For a vegetarian version, omit the chicken, and use vegetable broth. 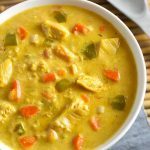 RESOURCES TO MAKE INSTANT pot Mulligatawny Soup and more! What is the purpose of the flour? Is it for thickening? Can I sub arrowroot flour? Looks really good! Yes, it is to thicken it. Use any thickener you like. Even potato starch. Thanks for the question, it might help others, too! Yes, you are right. I developed this recipe using the older pots that didn’t have the burn error, and are not as sensitive. I have been going through and updating these recipes that call for the flour to be added befoer pressure cooking. I thought I had already updated this one. I just did, so you are good to go! Thank you for your question! Any recommendations for a vegetarian/vegan version? Hi Carmen, for a vegetarian version, omit the chicken, but still sauté the onions, etc. Use vegetable broth in place of the chicken broth. Delicious! I haven’t eaten this soup since I was a kid, living in the UK. My husband had it at a local deli and was really excited when I told him I was going to make it. He said it was just as good as their one! I prepped everything while the kids were napping, so it was easy to ask the together when we were ready for dinner. I’ll definitely be making this again. Thanks! Hi Marie, I’m so happy to know that you and your husband liked this soup! What a great compliment! Thank you for your review! One of the best dinners I have ever made! My husband and 1 year old couldn’t get enough of it. Thank you for the recipe! That’s wonderful, Kristen! Thank you so much for your review! Thank you for the great recipe! Enjoyed all the flavor in this soup! I served it with naan. That’s awesome, Sharon! Thank you for letting me know! I tried to make this today but I ended up getting the “burn” notification on my IP and there was some burning at the bottom (obviously I turned it off and emptied it out). I realise this is a thick soup to begin with and I followed the recipe to a T. Any suggestions on how to avoid this is the future without compromising the taste/thickness of the end product? I haven’t had a good mulligatawny since I was a teenager and I was so excited to try this recipe. Hi Kari, Mix the flour with the cream and add it in after pressure cooking. Then let it simmer a couple of minutes on Sauté to thicken. Sorry you got the burn message. This is an awesome soup. We all loved it!